The perfect blend of spicy and sweet. The Burning Mandarin Martini isn't too hot, but has just heat enough to make it interesting. This is a sophisticated cocktail and is sure to impress. A simple and tasty basil pesto recipe with fresh basil leaves, pine nuts, garlic, hot pepper, Parmesan cheese, extra virgin olive oil, and salt and pepper. This is a really simple, addictive and spicy appetizer. I make a lot of these stuffed jalapenos during any gathering, because they don’t last long. Making hot pepper jelly is fairly quick and easy! I recently made jelly using Red Savina habaneros. Use your preference of peppers. A great tasting, healthy, easy to make spicy Thai lettuce wrap recipe, also known as larb or laab. This is a super easy dip for those that love pickles and heat. My recipe always uses Mikey V’s Spicy Pickles. I’d recommend some good thick Kettle chips for dipping! Everyone that tastes this dip is instantly addicted. This is a Paleo friendly spicy meatloaf, omitting the use of breadcrumbs, milk, sugar, and ketchup. This recipe pumps up the flavor with fresh pepper heat! This insanely tasty spicy Korean chicken sandwich combines spicy deep-fried chicken breasts, seasoned flour, a pickled slaw, and a unique sweet & spicy Korean Gochujang sauce. Pico de Gallo is an easy, healthy and flavorful condiment for topping all of your Mexican food favorites. Also called salsa fresca In Mexican cuisine. This is a delicious, super easy, spicy vinegar coleslaw recipe sure to please. Want it hotter? Substitute serrano or habanero pepper for the jalapenos. Ginger Habanero Simple Syrup recipe. A great way too add some sweet heat to any cocktail. Super easy to make. View the step by step recipe here. Roasted Shishito peppers in sesame oil is quite possibly the best tasting thing ever! These mild, sweet, and delicate peppers that originate from Japan are easy to make and delicious to eat. Try this Asian inspired, uniquely flavored sweet and spicy sauce in place of BBQ or buffalo sauce. Slather on chicken wings & fried chicken breasts, or use as a dipping sauce. These are the best Buffalo-style hot wings ever. They are grilled, not fried. Steaming the wings ahead of time makes them super juicy! The perfect blend of spicy and sweet. The Burning Mandarin Martini isn’t too hot, but has just heat enough to make it interesting. This is a sophisticated cocktail and is sure to impress. These crab cakes don’t use fillers or bread crumbs, they emphasize the crab meat, and get their heat by adding Harissa, a North African hot red paste whose main ingredients are chili peppers and garlic. 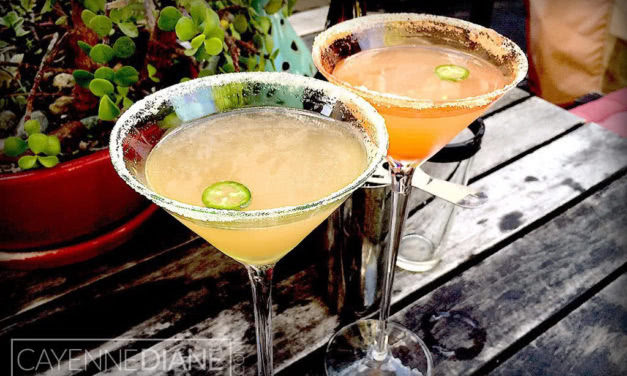 A delicious spicy cajun martini recipe made with jalapeno marinated vodka & pickled cherry peppers. What makes my version different is I really love adding cumin to Guacamole. This is a spicy, no rice, stuffed bell pepper recipe. Much of the heat comes from the Ro*tel tomato mixture. Use can use any ground meat you like, beef, chicken and turkey all work. A super simple recipe that sweetens that habanero heat, creating a yummy sweet and spicy snack. Great on sandwiches or enjoying on its own!